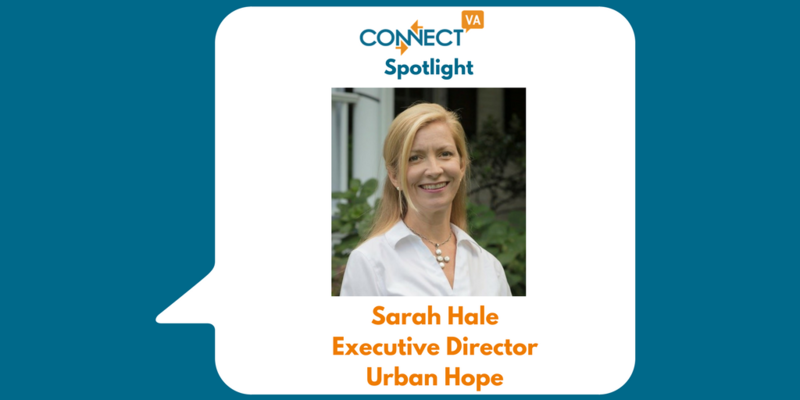 My name is Sarah Hale, and I am the Executive Director of Urban Hope. For most of my career, I was in residential interior design. What I loved most about that work was the ability to improve the everyday lives of families through effective design, and it left me longing for a deeper, broader impact. We all understand the power of home, for better or for worse, and I came to Urban Hope with the intent of helping our city improve the prospects of home for those who need better. Urban Hope exists to make home a cornerstone of opportunity. When someone comes into the Urban Hope family, we want it to be the beginning of a positive trajectory that will improve all areas of their life; we focus on housing, as it has such a profound effect on all areas of life, including health, education, and employment. It is our aim that clients who come to us receive inspiring, solid financial instruction, and are given the support they need to improve their financial picture. For those who are financially ready, we provide safe, affordable, high quality housing in the East End. The real estate market in the East End is challenging right now for those who need lower rent or are looking to purchase a home on a modest income. To address this, Urban Hope aims to secure and maintain as much affordable rental housing in the East End as possible, so that existing residents, especially long-time residents, are not forced to leave the neighborhood. We also have a homeownership option for those of our clients who are able to purchase a house, and we operate on a lease-to-purchase arrangement. Urban Hope occupies a special niche in that we serve mostly families and individuals who make 50% or less – often much less – than the area median income. This is a challenging bracket in which to work; often folks who are at this income level are one flat tire away from devastating financial setback. It is our intent that with education, mentorship, and encouragement, more people will be able to improve their financial situation and achieve housing stability. The year is ending soon! Will you help us close the gap?Visit www.urban-hope.org/donors/give-now/ to make a donation today!Help Urban Hope finish 2016 strong for all the right reasons– bringing shalom to our city! The most rewarding thing about our work is the knowledge that what we do all day, every day, is very tangibly helping to improve the lives of our clients, as well as the future of this neighborhood, and by extension, our city. We envision a thriving community where everyone can feel at home; when we are securing affordable housing that will stay affordable, we are working toward that vision. What are some major challenges you have faced and how have you handled them? Well, as I mentioned, the real estate market is truly a challenge – and one of our biggest. We always have our ear to the ground to discover houses that will be solid properties for our portfolio, but real estate investors are making that increasingly challenging. For example, properties that might have been affordable at auction often now sell for well over what we feel is prudent to spend, as they must be purchased virtually sight-unseen. Speculators with deep pockets can and do pay top prices, and often hold on to abandoned properties without improving them, in hopes that their investments will appreciate. Instead, these properties sit untouched, and blight remains. As mentioned in this 2017 article by Bob Adams and Laura Lafayette, the General Assembly has cleared the way for Virginia to create land banks. It is our hope, along with the authors’, that the Maggie Walker Community Land Trust will become the home of Richmond’s land bank, providing a better avenue for Urban Hope and other affordable housing nonprofits to acquire properties and develop them for the good of the city. One great thing is that we have had properties donated to us, which is a huge blessing, and a great way to make a big impact, for those who are able. We continue to scout for properties that will make good homes, properties that are in solid shape and worthy of our hard work. Something that is special about Urban Hope that I think might surprise people is that we are almost entirely privately funded; our model is impact investing, whereby investors place their money with Urban Hope for a modest return. At the end of their agreement with Urban Hope, their original investment is returned to them, or reinvested for more creation of affordable housing. This is a great way for investors to make a huge impact and get a return, all at the same time. It’s a double bottom line, and people do well by doing good! Urban Hope offers engaging and informative financial instruction; our Money Smart classes are held monthly and are proving to be a very practical and effective help for those who attend faithfully. As part of this initiative, we have financial mentors who volunteer to help our clients work through their finances. We also are planning our next round of acquisitions and renovations, which we hope will begin soon. This summer, we will be raising funds that will go, in part, toward lowering the renovation cost of our newest house, which will then lower the rent when it is complete. This summer, we will be creating the Elevate Fund, which will help our tenants when they have challenges meeting their rent. Instead of resorting to payday loans, title loans, or other costly methods sometimes used to borrow money, tenants will be able to borrow from this fund at a modest 5% return, and as they repay that debt, they will be repairing their credit, and keeping a roof over their heads at the same time. 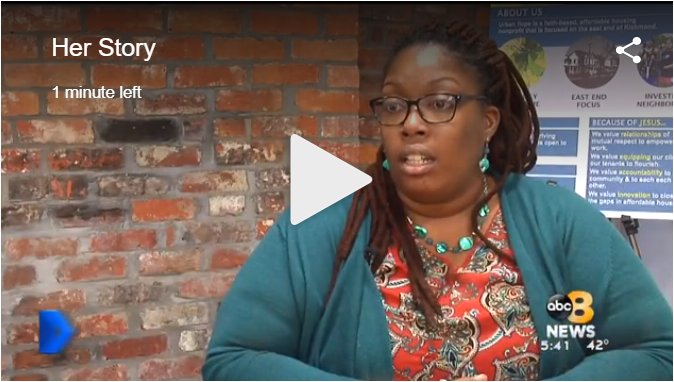 ABOVE: A recent video by ABC 8 News on Urban Hope’s Director of Housing and Family Services, Carolyn Lofton. Urban Hope is a member of RCDA (Richmond Community Development Alliance). We also are a member of the housing action team with Richmond Promise Neighborhoods, and we collaborate with the city’s Office of Community Wealth Building in the focus area of housing. We participated in the city’s 2017 Housing Summit and will continue to collaborate as invited. Urban Hope collaborates with the Neighborhood Resource Center for financial and job counseling. In addition, some of our clients receive down payment grants from HOME (Housing Opportunities Made Equal). We partner with Entrust Financial Credit Union to help facilitate our financial counseling. We participate in Transformation in Action, a group dedicated to the betterment of the commercial corridor on 25th Street. One of our staffers sits on the board of the Maggie Walker Community Land Trust, and we also participate in The Gathering (a group of local organizations founded on Christian principles), and BlessRVA (a group of local ministry leaders focused on effective collaboration for the City of Richmond). Additionally, we have been awarded a sizable grant from the City of Richmond’s Affordable Housing Trust Fund, and we are looking forward to putting those funds to good use in our next round of renovations. We use ConnectVA to seek collaborations and resources we believe would help our clients and our mission. It makes us deeply hopeful that with increased connections and improvements in communication and collaboration, we can make some real, tangible progress in addressing the challenges faced by the citizens of our great city. It is my hope that we can find many more people who would like to engage with the challenges of affordable housing. Urban Hope has many ways to engage; check out our website to see all the options http://www.urban-hope.org! That said, we are one of several terrific organizations working on affordable housing in Richmond, and we are happy to be counted among these hard-working folks. Thanks for reading! Hello i am a single mother of 4 children and we are homeless at this moment where we were evicted from public housing because i couldnt keep up with the always increasing rent. And i am looking to make a better future and secure home for me and my children. Please se d me any information as to how i can join your program! Thank you in advance.